Macroblade 90 is the quintessential model for someone looking to upgrade up from their older skates and wants to skate a little faster. 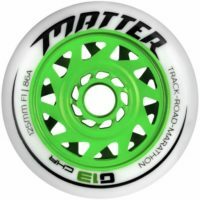 90mm is a great “go to” size for wheels and the fit and support of the Macroblade 90 is incredible. 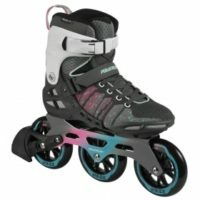 The higher boot design helps add more stability when learning to ride taller 90mm wheels thus creating a better sense of stability and control when skating. The liner utilizes engineered mesh for a added breathability, sock like comfort and has all the cushioning one could need to make learning how to skate much more pleasant. The aluminum frame adds more power transfer and durability. The closure system is easy to use and secures the foot to maximize fit and comfort. 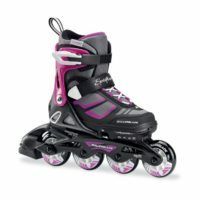 The wheel/bearing set up is ideal for skaters to have the right amount of speed and control without going too fast. Brake is on the skate. 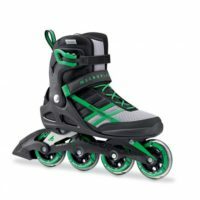 – HIGH PERFORMANCE SKATES for the fitness enthusiast who wants a little more lateral support for stability while looking to train, exercise or skate faster. – COMFORTABLE ATHLETIC SHOE ENGINEERED MESH UPPER has padding in the tongue and ankle areas to cushion the feet. Buckle, powerstrap and lace lock closure secure the feet with added breathability. 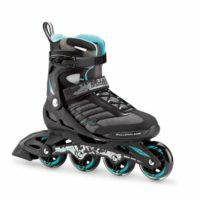 – TWINBLADE ALUMINUM 11″ FRAME is durable and helps keep skaters closer to the ground with its low profile design for enhanced speed, balance and stability. 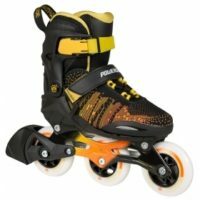 – ROLLERBLADE PERFORMANCE WHEELS 90mm/85A wheels blend speed and control perfectly. SG9 bearing spin is superior and helps provide the appropriate speed.